I want to share with you a new free podcast that I’ve heard about. It’s a new resource for learning to speak the Irish language online. The new podcast is in the Ulster dialect of Irish (generally in the north of Ireland). If you’re a Bitesize Irish Gaelic member, you can read our lesson on dialects where we even argue that starting to learn a mix of dialects is perfectly fine. 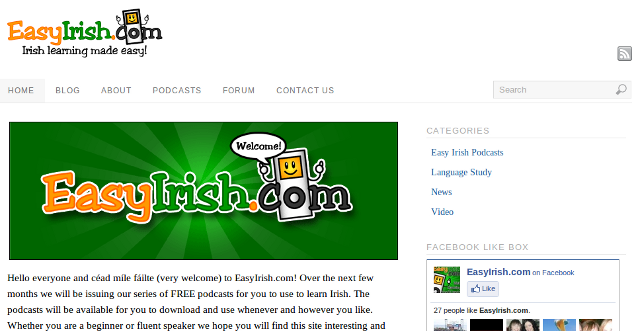 EasyIrish.com is the home of this new podcast I wanted to tell you about. They have MP3 downloads and PDF worksheets. It’s hosted by Antaine and Jarlath in Strabane, Co. Tyrone in Northern Ireland. It seems that their organization has been teaching the Irish language locally for many years. I hope you’ll enjoy the podcasts (and that you understand the accent!). If you check them out, I encourage you to send feedback to Antaine and Jarlath about what you thought about the podcast.